New Care Notes are available in a rack on the right wall near the Sanctuary entrance. These 8-page booklets offer spiritual encouragement, help and hope. Les Esmond has acted as chief cashier at Pender Re-Gift Thrift Store since May 2012, volunteering forty hours a week, fifty weeks a year. 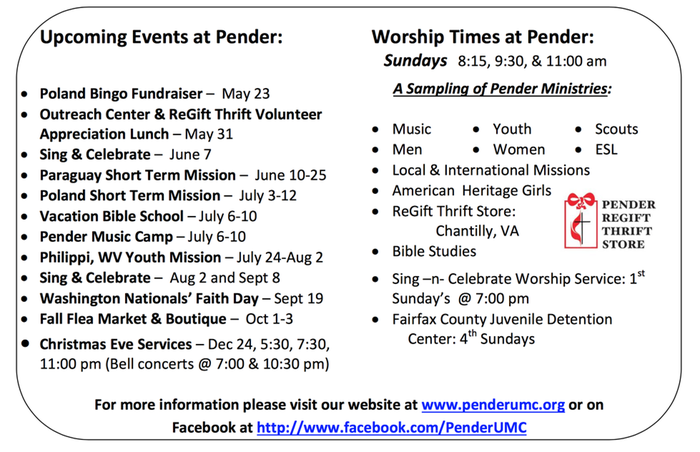 Pender Thrift Store, a wholly owned subsidiary of Pender United Methodist Church, accepts clients from government, nonprofits, and other churches for the distribution of material goods. When Les comes to work every day, he tries to make each and every person feel better — he talks and laughs with the lonely. He has overcome computer phobia to learn two new software systems. He instructs others on how to “cashier.” He is diligent about learning the names of the customers, and if they have a minute, he regales them with a history lesson or relates a story of pride in his family of three children, two grandchildren. What this description doesn’t tell you is that Les Esmond has battled serious health issues for over fifteen years; however, despite adversity, but he tackles life with gusto! He buys lunch for others, provides bags and paper products for the store, offers rides and picks up groceries for others at the independent senior living facility where he stays. Child Protection Policy 2016 – It’s a New Year!! Complete the CPP Application and Annual Renewal Form. The CPP policy, training & all the forms can be found on our website, www.penderumc.org/cpp or you can search for CPP in the search box in the upper right corner of the home page. You will be able to view and/or download the policy and print out the applicable forms. Return completed the forms to the box on the welcome center in the narthex. There is a informational letter as well as all necessary CPP forms located in the narthex. If you are a cluster lead or heading up a youth program, please use the informational letter as a reference. After March 1st, if you haven’t completed your forms, you will no longer be able to volunteer with children. If you have any questions call Heather Amos at (703) 266-2424.